Infrared thermometers are small hand held thermometers which can measure temperature from a distance. 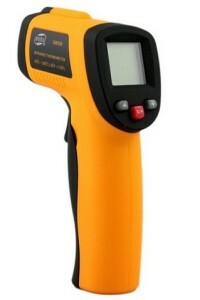 These are known under various different names such as Laser thermometer, Gun thermometer, Infrared gun thermometer etc. The basic operational principle is y means of infrared thermal radiation. The laser is used only for aiming at the object and not for measuring the temperature. There are two apertures for the device,one is for the laser bean and the second one consists of a lens for measuring the temperature. The measurement need not be exact and depends on various factors such as the ambient temperature of the instrument, distance from which measurement is taken etc. Hence generally this thermometer should not be considered for applications where extreme accuracy is required. Alternatively if you are using the same for a certain application all the time, you may test the test the actual temperature using other mode of measurement also and can decide the accuracy by comparing the readings. Testing procedure for most of the type of IR thermometer is very simple. Simply press and hold the button. Point the laser beam to the desired surface. The temperature will be displayed on the screen. Please check the distance range of the instrument and use accordingly. For longer distances, readings will be shown on the display, but is prone to error. This model has a recording function and also has an alarm function. The higher and lower limits can be programmed and if the measurement is beyond this range, it will indicate an alarm. Thermal Imaging IR camera is advanced version using the same principle, but used for analyzing thermal distribution. We are supplying various models of IR cameras manufactured by Trotec, Germany. More……. 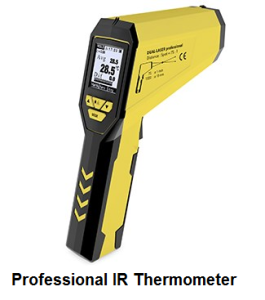 Vacker Arabia supplies different models of infrared thermometers in all cities of Saudi Arabia covering Jeddah, Dammam, Riyadh, Jubail and Khobar. Could you please send your quote for the following item to my email? Can you please give me information, prices and lead times of hand held Pyrometers? One of our sales engineers will get in touch with you within today.